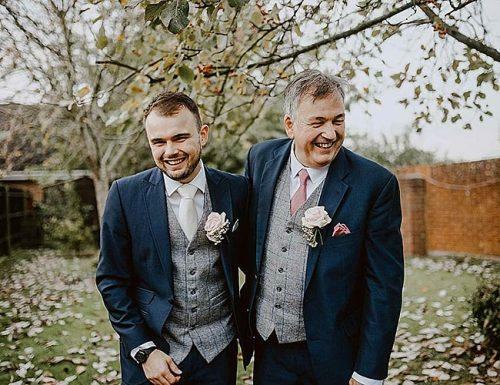 Your son is getting married, and as the big day approaches, amongst all the planning and emotion, you have to think about your father of the groom speech. This might as well be one of the most important speeches of your life. In the order of wedding speeches, the father of the groom speech is traditionally done after the father of the bride speech and before the best man speech. So you will want to be ready. 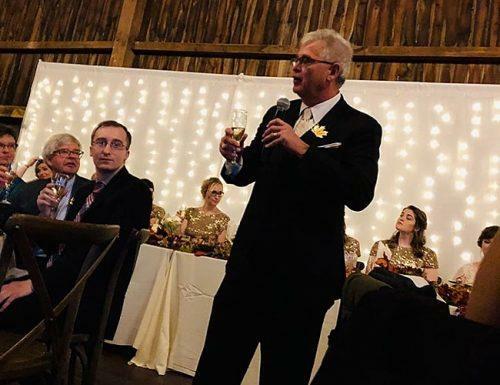 The father of the groom speech usually involves welcoming guests and family members, toasting the happy couple, and telling a few anecdotes about the groom. Thank the father of the bride for his speech, and introduce yourself. Briefly, thank guests and family for coming. Talk about the groom and share memories and jokes. Talk about the bride/his partner, what you know about them, and your son’s happiness. Welcome the bride/his partner into the family, and give the bride and groom advice as a married couple. Make a toast to the happy couple. While it’s great to add humor to your speech, you should be careful that it doesn’t go too far. Just the right amount of funny in your anecdotes that would keep your audience listening and in no way roast your son. It’s okay to show whatever emotion you feel on this big day and in front of your family and friends. It’s totally understandable, and you can include it in your words if you much prefer. In the body of your speech, you can talk about your son’s childhood, his nicknames, friends and memorable moments. Mention your family and the role he has played; also about the couple and how his new relationship has brought him love and happiness. You can also talk about your personal relationship with your son. Leave the couple with words of wisdom. You’ve been on the journey they are about to embark on, and any advice you give will make your speech even more memorable. In a case where the father of the groom is unable to speak, perhaps for medical reasons, it is okay for the mother of the groom or some other close family member to speak on his behalf. Writing a speech from scratch is totally admirable and acceptable. However, at such a demanding time as a sons wedding ceremony, it can be quite helpful to get some inspiration along the way. Below is a few Father of the groom wedding speech examples that can help with that. It can be very hard to find a love like the one [groom] and [bride] share. It is a rare thing to have and if you are lucky enough to find it, you better not be foolish enough to let it go. I am so happy and full of joy to see the love that [bride] and [groom] have for each other. And I am grateful that I was able to witness my son fall in love and get married to the woman of his dreams. I cannot wait to see what lies ahead in the rest of their future together. As someone who raised my son to be a perfect gentleman, I have to tell you [bride,] that you have landed quite the catch! But you know who is even luckier? My son, for having found you. You are an exceptional person who means the world to [groom] and you hold a special place in my heart to because you are the woman who makes my son truly happy. My hope for my son and his new bride are that they find the same comfort in each other that my wife and I find in each other every day. If you ever feel lost, look to each other for support and guidance. When you are happy and have achieved a dream, celebrate with each other. This is only the beginning of a great journey for the two of you and I wish you the best of luck on this amazing adventure together. [Bride] and [groom,] you know that I have been married for a long time. And while I can joke about the downsides of marriage and the little disagreements that inevitably happen, it is much more worthwhile to talk about the benefits of marriage. Because when you are with the right person, the positives will always overwhelmingly outweigh the negatives. Some people have no idea when the meet “the one.” Sometimes it takes some time and a few pushes before the sparks begin to fly. Slowly but surely, what is meant to be happens and two people form and indescribable and inseparable bond that can stand the test of time. If you have ever experienced this phenomenon before, then you know exactly what I am talking about. And I know that [bride] and [groom] know exactly what I am talking about. When I look at them, I see a love that is pure and strong. I know that they will build a happy life together as a married couple. Marriage is a fun adventure that is full of surprises, twists, and turns. As someone who has been married for a long time, I am still on this exciting journey. And I have to say that it never gets old, being married to the person that you love. Love one another, pay attention to each other, and learn to put the other first. [Groom,] my wish for you is that you and [bride] have the same good fortune and love that has gotten your mother and I through all of these years. May you always love each other and be full of patience and understanding. Be honest and loyal and good to each other. And I sure do hope that you make each other laugh until you cry. Never let each other go. [Bride,] [groom,] congratulations to you both. I wish the two of you all the happiness in the world. While I know that you two are already a blessing to each other, I know that you will continue to live a blessed life together as man and wife. When I think of [bride] and [groom], I am hard-pressed to think of two people who are better suited for each other. They both make each other wiser, more patient, and strong. Anyone who knows them knows that they care about each other deeply. There is true love there that can withstand the test of time. I have always been a firm believer that God always has a plan for all of us. It is what led me to finding my wife, which has led to us having our son [groom.] And I believe that God also led [bride] and [groom] to each other. Some call it fate, but I call it God’s plan. When my son found [bride], I was so thrilled with him along with the rest of the family. We were so excited to get to meet the woman who makes [groom] so complete. [Bride,] we have never seen [groom] as happy as he is than when he is by your side. There are no words for me to express how thankful I am to you. Now that I know you, I love you like my own daughter. Welcome to our family. Because of this, I have always wanted to see him happy. I always hoped that he would be successful in life, whether it was winning a sports game as a kid or getting his dream job. No matter what, I always had his back and did whatever I could to root for him. And so I root for him now as he begins a new journey with my daughter in law, as we can all attest to the fact that she makes him very happy. As [groom’s] dad, I always tried to have his back on everything. I wanted him to know that I would always be there for him through the good times and the bad ones as well. [Groom’s] blessings and trials are ones that I also experience myself. What he goes through, I go through too. And I always have hoped for the best for him from day one. Even now that he is older, he is always still in my thoughts and prayers each and every day. And I have to say that one of my biggest prayers for [groom] was answered. That he would find someone who would love and appreciate him. That this special person would be a great partner to him for the rest of his life. Thank you, [bride] for being a blessing in [groom’s] life. Because of this, you are a blessing in all of our lives as well. Having a son has been my greatest blessing in life. In many ways, [groom] is like my mini-me and my twin. But over the years, he has grown and he has become his own person. While I have tried to teach him many things over the things, he has taught me caught a few important things as well. [Groom] is someone who really cares about people and he will always go the extra mile for the people in his life. As [groom’s] father, I would like to take this opportunity to thank [bride’s] parents for raising such a wonderful young woman who love my son so dearly. Nobody in this world can love him quite like you do. You seem to have brought out the best in [groom,] you make him so happy, and for that, I am eternally grateful. Congratulations to you both on your wedding day. Here are some hopes and dreams from a devoted father to his loving son on his wedding day. I hope that the two of you live a life together that is long. I hope that this shared of life of yours is full of joy, laughter, abundance, love, and many other good things. May you always have each other to lean on. [Groom,] as your father I am very proud to know you. I have had the rare pleasure of watching you grow from a little baby into a wonderful young man. You cannot possibly know how proud I am of you and how much I love you. Congratulations to you and your lovely wife on your wedding day. As someone who has been in love before and stayed in love up until this very day, I know what it is like to get caught up in romance. From the day the two of you decided to take a chance on each other to the moment you popped the question and she said yes, you have probably been taken through a whirlwind of events throughout your romantic journey together. After the engagement, naturally, comes the wedding planning. It can be an exciting time and a stressful one as well. There are so many things to think about and now the has finally arrived. You can both rest easily knowing that your wedding day was a success, full of happiness and love and the people that are near and dear to both of your hearts. Next of course, comes your honeymoon, a fun and relaxing time for any married couple. A chance to enjoy the first days of being husband and wife, a real opportunity to get away from the noise, chaos, and responsibility of life. Savor this time together and enjoy those peaceful days of your honeymoon. When you come home, reality will begin to sink in. You will really get to work on building your home and new life together. From now on, all of the decisions that you make will be together as husband and wife. This does not mean that the fun times are over. In fact, this is only just the beginning of many more lovely experiences together. [Bride,] you look absolutely beautiful today. It is like watching your own daughter get married and as of today, you are officially my daughter because you married my wonderful son. 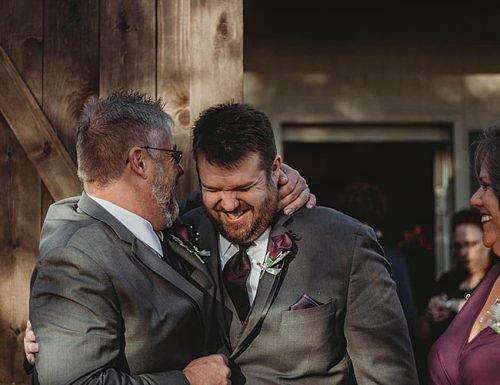 As [groom’s] father, I have always made it a point to let him know how loved and appreciated he is. He knows how much he means to me and how important he is in my life. So I thought that I would take this opportunity to sing my praises instead for [bride,] [groom’s] wife and my newly-coined daughter-in-law. It is official, [bride] and [groom] are now newlyweds. What does this mean, exactly? Well for starters, you are family now. You have your parents, siblings, and friends, but at the end of the day, you must come first now. From this point forward, you will be inseparable. You are not just living side by side, now you will be living as one team, a unit that will make important decisions and meaningful memories together. Remember to be kind to each other. Be patient and understanding. Don’t forget to communicate, to laugh, and to love each other. Do these things and you will have a great recipe for a happy, long, and successful marriage. Let us all take a moment and raise a toast to the new couple. [Bride] and [groom,] separately you are two wonderful people but together, you are even better. You finish each other’s sentences and can communicate without even saying a word. You know how to make each other laugh and smile and you know how to comfort each other as well. [Groom] and [bride], while you have loved and cared for one another for a long time, today makes it official: you are now a married couple! I give you all of my congratulations and I hope that you feel the outpouring of love and support for the both of you that is in this room today. The two of you are surrounded by people who are all so happy and thankful to be able to be a part of your special day. I think I speak for everyone here when I say thank you, and I hope that we have all helped in one way or another to make your wedding a day to remember. Click HERE to download these examples! There are quite a number of speeches at a wedding ceremony. The best man speech, maid of honor speech, and even mother of the bride speech. All important and relevant to the couple and wedding guests. So, while there are no hard and fast rules for such speeches, remember to keep it short and sweet, and end it while raising a toast to the happy couple.